Norfolk continues to surprise me. Just when I think I've got the hang of it, I come across somewhere like St Peter. 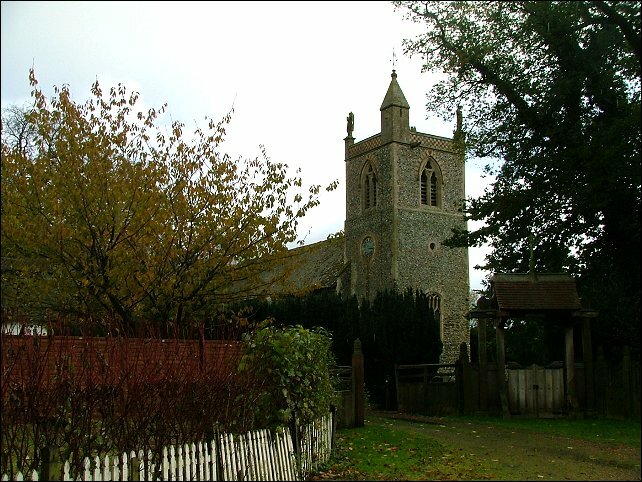 Before coming to Ketteringham, I had no idea what I would find here - I'd never even heard of the place, if I'm honest - and the church is so awkward to find that I might even have given up. I'm glad I didn't. Ketteringham is just south of the main A11 road, but clever planning policies have left it feeling remote; more remote than it felt before the new road was built, probably. The village straggles along a mile or so of street, and the church is about half a mile to the south. My OS map showed a road leading up to it, but when we looked for this road it turned out to be the private drive of Ketteringham Hall, and was very firmly locked off. Instead, we had to go out into the country on the road to East Carleton and then come back northwards towards the church. 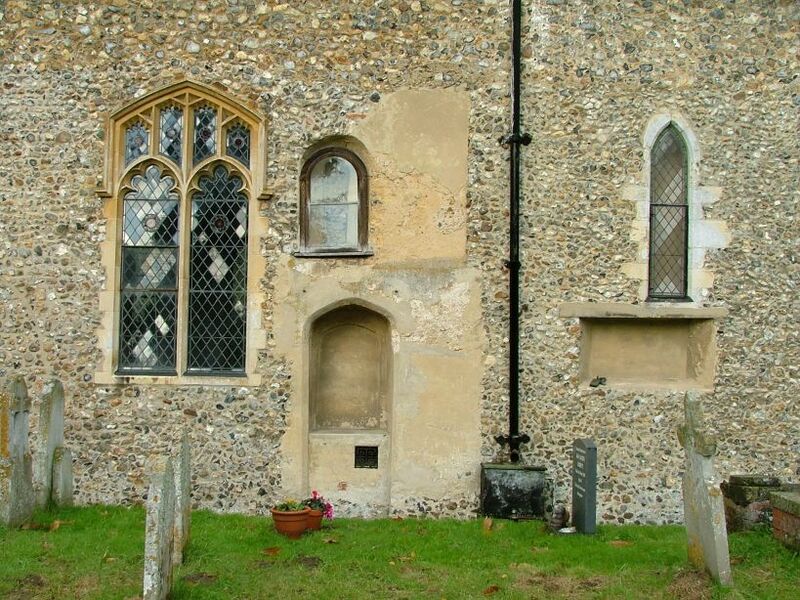 It sits immediately beside another entrance to the Hall grounds, and you can see at once that it was a park church, the main churchyard entrances pointing towards gates into the grounds, the public lychgate in the corner added almost as an afterthought. Another sign that this was a park church is that it was patently given a good going over in the late 18th century. The antiquarian-minded squirearchy of the times didn't know much about medieval architecture, but it knew what it liked. Hence, the fortress-like pinnacle to the tower stairway, and the guardian angels at the other three corners. 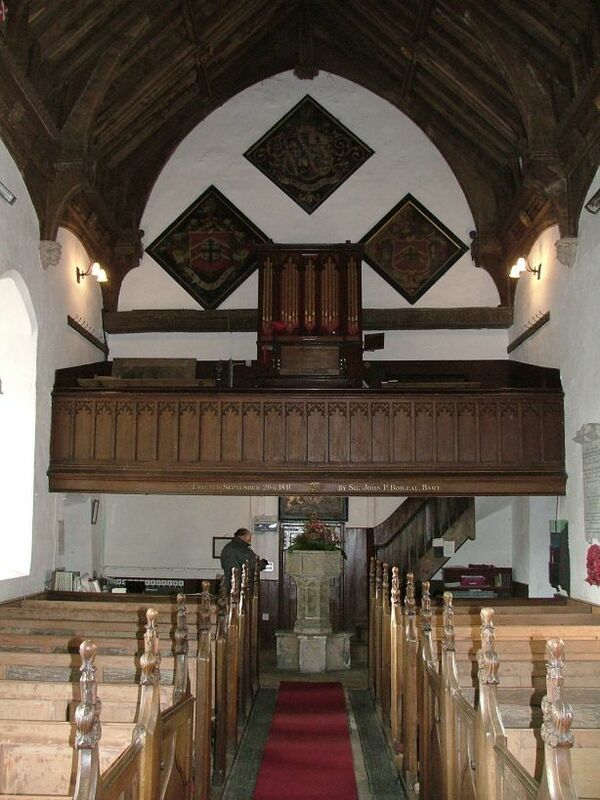 The residents of the Hall at the time were the Atkyns; their successors were the Boileaus, whose famous mausoleum is to the east of the church. It was built under very traumatic circumstances, one of the central incidents in Owen Chadwick's masterly Victorian Miniature, a book I only read after my visit here, but which will send me back there as soon as possible. 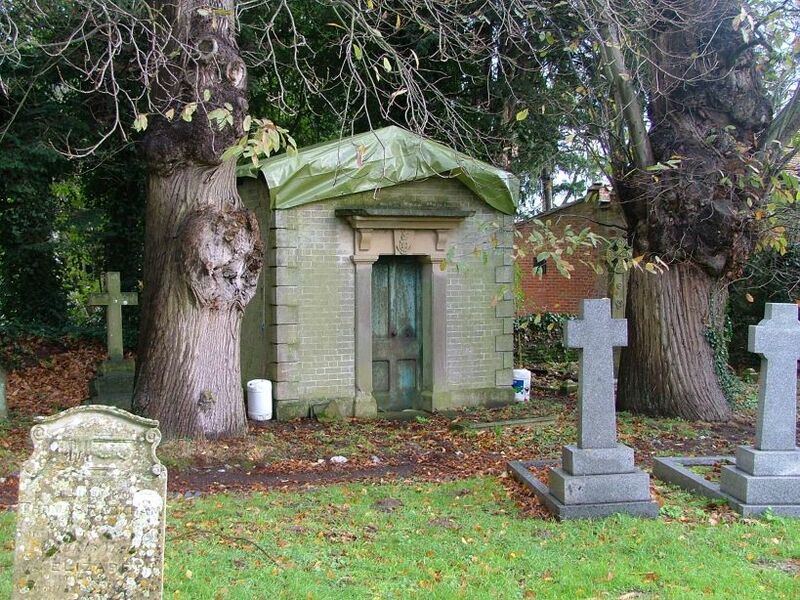 The mausoleum, a blockish thing in a kind of Egyptian Doric style, was covered in tarpaulin when we visited in December 2005, and I later discovered that it is on Norfolk's 'Buildings at risk' register. 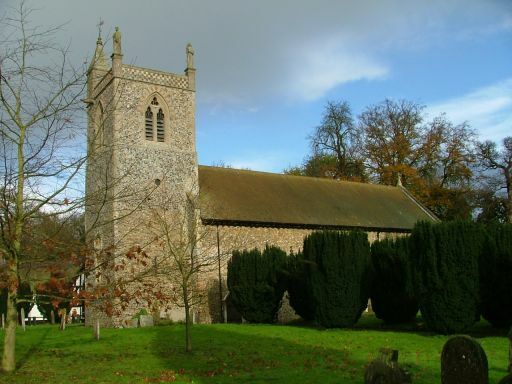 Mary Parker, a churchwarden, contacted me to say that it has caused concern for sometime; as the Boileaus no longer live at Ketteringham (they left in 1947, as a consequence of two hefty lots of death duty) the family no longer feel a commitment to maintain it. There was a request by them in 1991 for it to be demolished, but the mausoleum is now a listed building, and this will not happen. After a time when maintenance was a considerable burden to the parish, the Mausoleum and Monuments Trust have agreed to take it on, and it will be repaired when the frosts are over. For many years after the Boileaus left, the Hall was a school; today, I believe, it is the headquarters of Lotus Cars, but previous residents have left their mark upon St Peter, as we shall see. St Peter is kept locked, but has some of the friendliest keyholders I've come across, just to the west of the church. They are extremely keen for people to see inside, and it will be well worth the effort. Just as the exterior tells you about the idiosyncrasies of the residents of the Hall, so the interior reveals their tastes. There have been four main families that have left their impression here - the Grays, the Heveninghams, the Atkyns and the Boileaus. 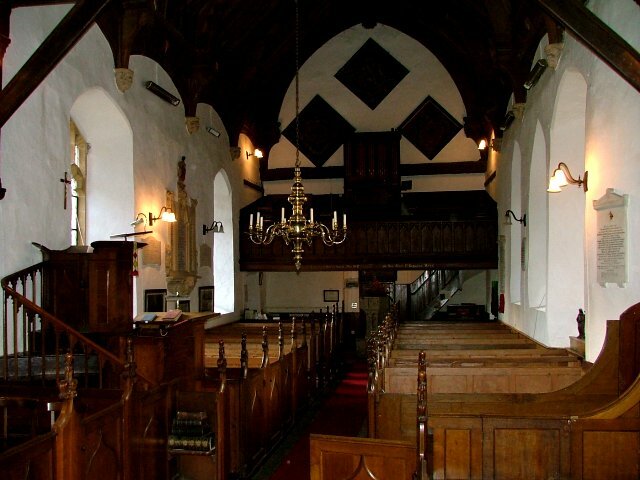 The atmosphere of the interior, at once rustic and grand, tells you that the Boileaus had more say in the 19th century than the ecclesiologists of Oxford and Cambridge ever did. Sir John Boileau, the hot-tempered, paternalistic Squire, was responsible for the elegant west gallery; he spent thirty years in dispute with the vain, egotistical, Calvinist Rector William Andrew, and his appalling wife Ellen, a tale recounted in Chadwick's book. The key lets you in through the vestry, and you step into a chancel which is quite overwhelming in the quantity of its memorials. There are over 500 years worth of them from all four families, and the best thing is that they are almost all both interesting and quirky - few of them are merely pompous or run of the mill. There are, broadly speaking, four groups. 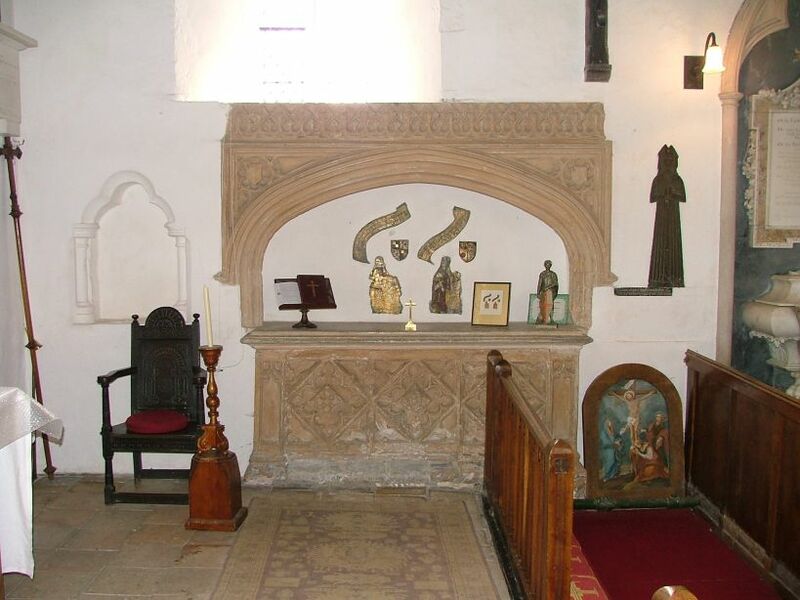 On the south side of the chancel is a large table tomb which might once have formed an Easter sepulchre. 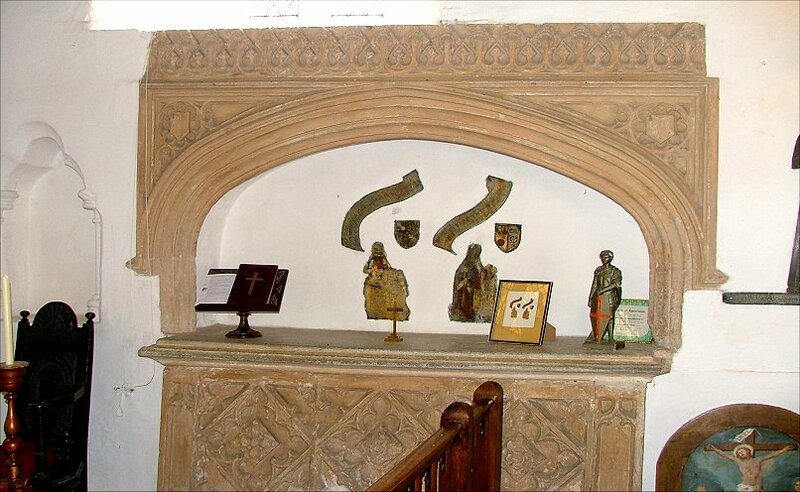 Set in its recess are two late 15th century brasses to Sir Henry and Lady Gray. 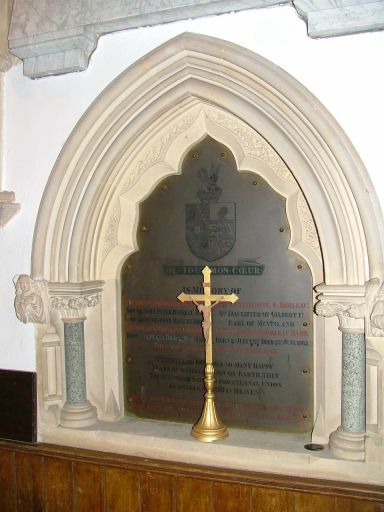 An older brass to Jane Gray is set on the wall to the west of it. 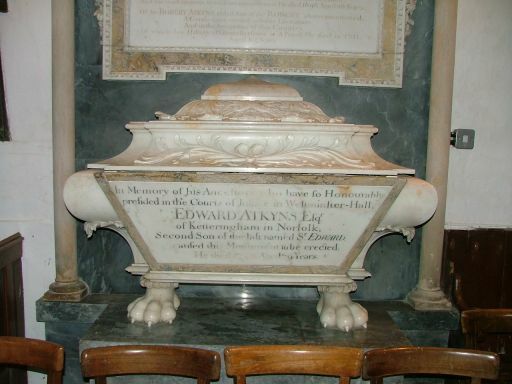 Moving west, the massive tomb by Robert Page for Edward Atkyns, who died in 1750, looks like nothing so much as a bath tub with lion's feet. 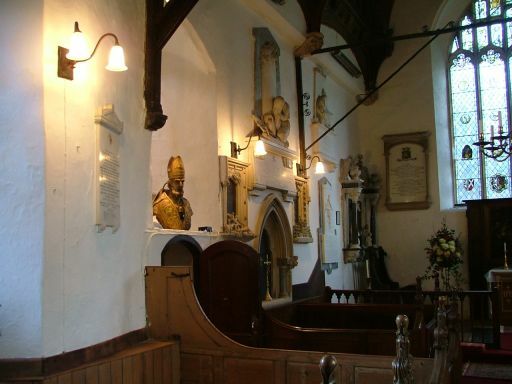 Directly opposite is the family pew of the Atkyns, later that of the Boileaus - memorials of both families tower above it, most prominently the weeping woman and urn on the Richard Westmacott memorial to father and son Edward and Wright Atkyns; the array of weapons stacked beside the urn recall that the son died in battle. 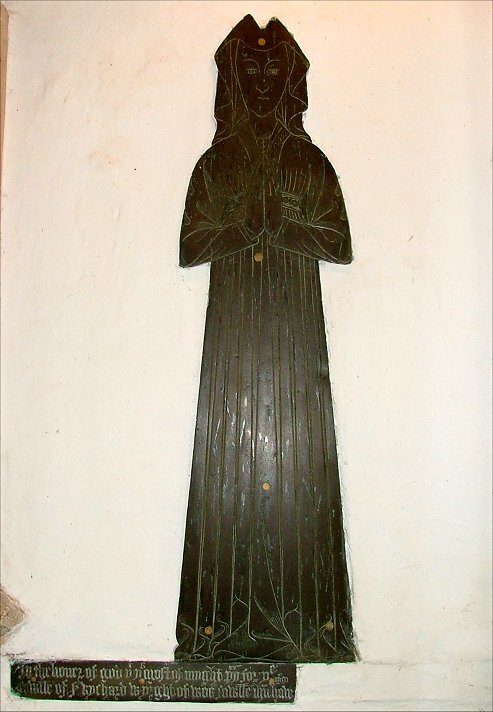 This is echoed in one of the later brass inscriptions set below to Charles Augustus Penryn Boileau, youngest son of Sir John Boileau. 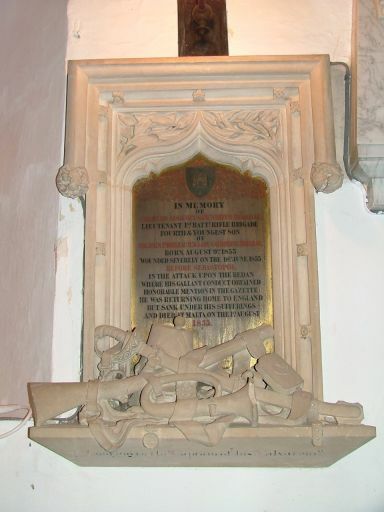 Something of a rake, he went to the Crimean War as a way of escaping his debts, and died in Malta on his way home as a result of injuries suffered at the 1855 seige of Sebastapol; a tangle of musket, sword, bugle and so on, is starkly carved from stone beneath. 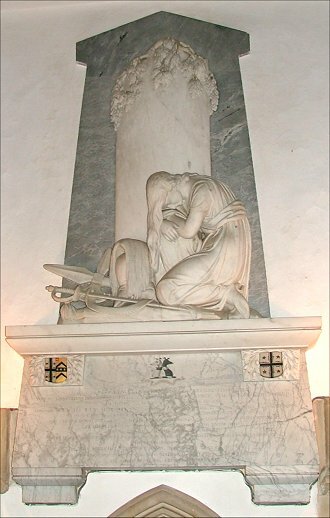 A memorial of similar size to John, Charles' eldest brother, matches it; more successful in public life than his brother, he was a parliamentary private secretary to Lord John Russell. Russell's retirement coincided with the end of the Crimean War; John rushed out to see it end, but caught a fever in Austro-Hungary. He came home, but was sent to the south of France to recuperate. He got as far as Dieppe, and died there in 1861. Between the two brasses is a central, larger one to their parents; SIr John Boileau, his movements, talents and emotions known to us today from Chadwick's book, a bull-headed yet sympathetic character who might have stepped out of the pages of Trollope, and his wife Catherine. 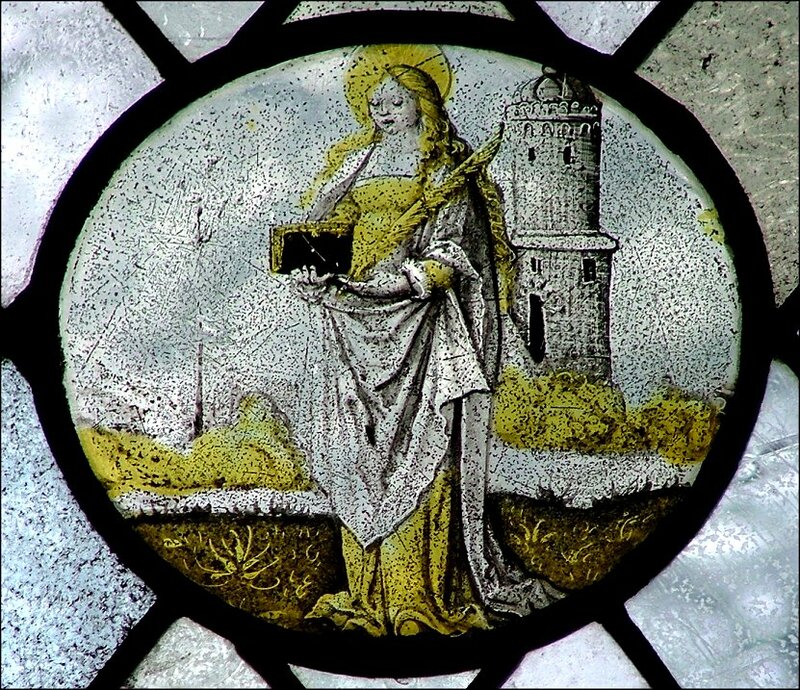 Catherine should have been remembered by a memorial window depicting the Saint that gave her name; but there was such an uproar in the parish, fanned by the Rector, about having an image of a Saint in the church that Sir John relented. 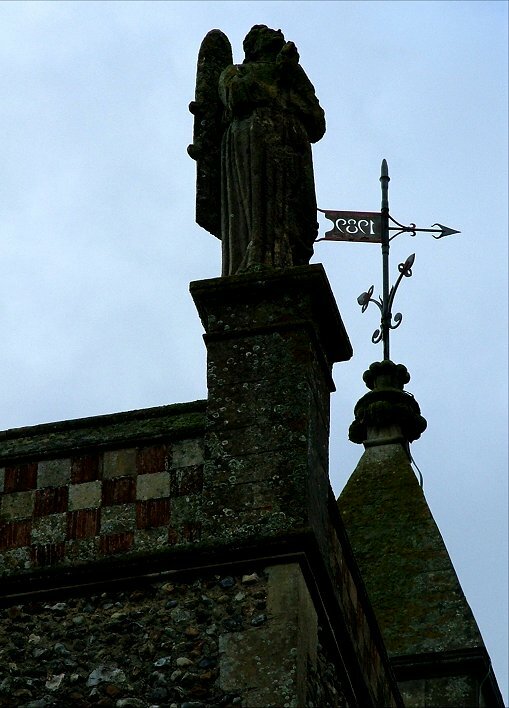 The Rector, who was not unkind, reported to Sir John that his greatest fear was that the simple people of the parish might think it was the Virgin Mary. Perhaps the most curious memorial is the most westerly one of this group. 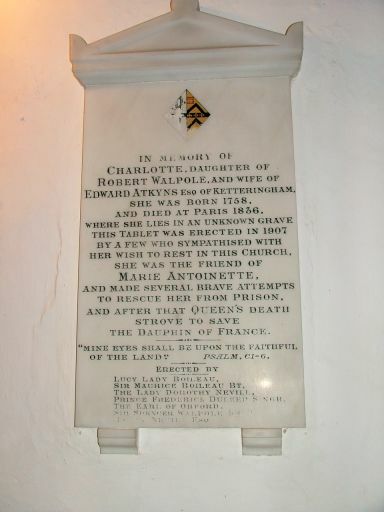 It is a 1910 memorial to Charlotte Atkyns, who died in Paris in 1836, and is buried in an unmarked grave; born a Walpole, she found herself caught up in the events of the French Revolution, and the inscription further recalls that she was the friend of Marie Antoinette, and made several brave attempts to rescue her from prison; and after that Queen's death strove to rescue the Dauphin of France. She bankrupted the family fortunes in her quest, mortgaging the Ketteringham estate and claiming to have spent an extraordinary eighty thousand pounds, about fifteen million in today's money. 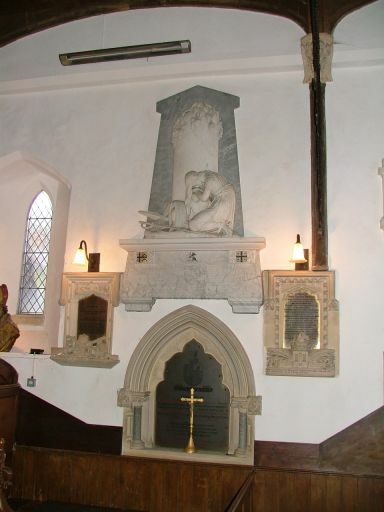 Owen Chadwick recalls that, on her death, she requested that her body be returned to Ketteringham and a marble slab be placed on the chancel walls. Her relatives of the time, left destitute by her enthusiasms, not unreasonably failed to carry out either request. 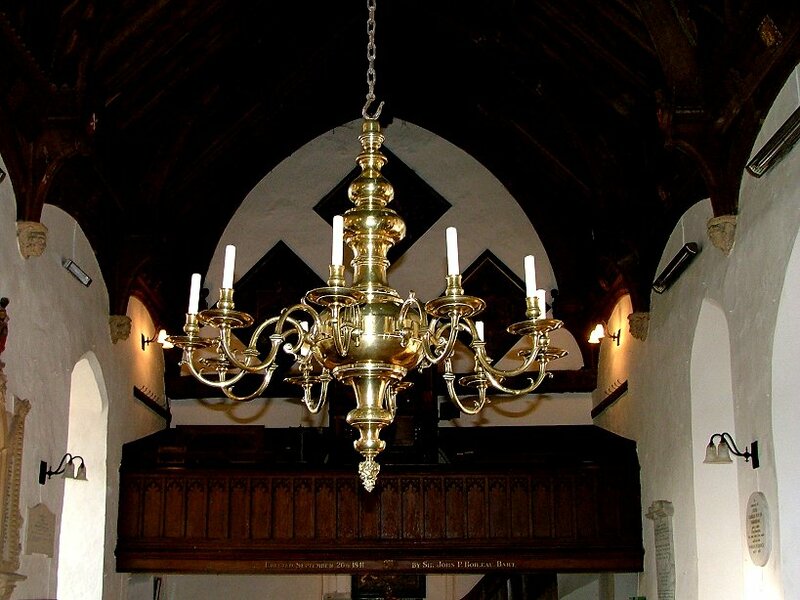 You might think that Charlotte's Francophile adventures and the French name of the Boileaus might indicate a family connection; in fact, the Boileaus were an old Huguenot family who came to Norfolk by way of Dublin, and already owned Tacolneston Hall. They bought the bankrupt Ketteringham estate after Charlotte's death. 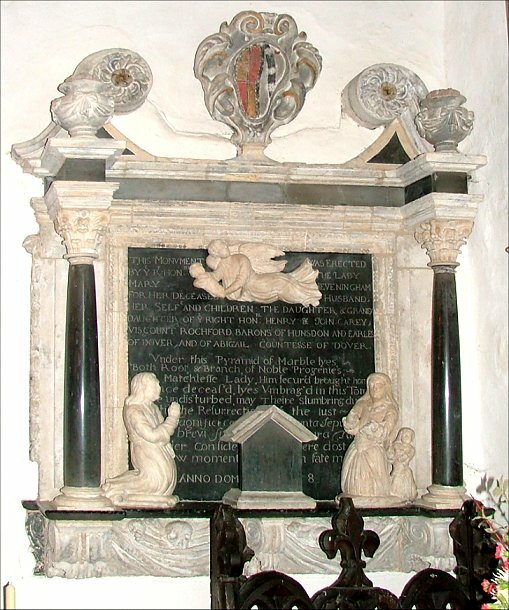 Perhaps the best of all the memorials is in the north-east corner of the chancel, to Sir William Heveningham and his wife Mary. 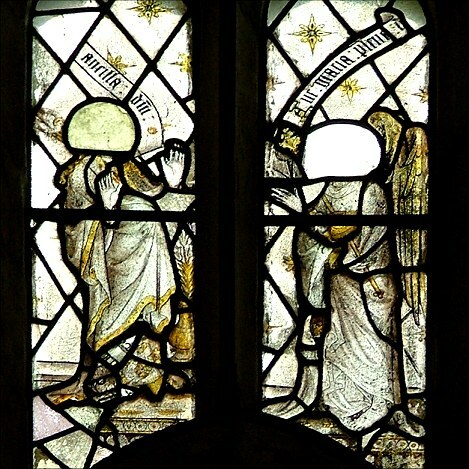 It is curious, the way the figures and prayerdesk at the bottom, and the ascending angel above, appear to obscure the inscription; but there may be a reason for this. 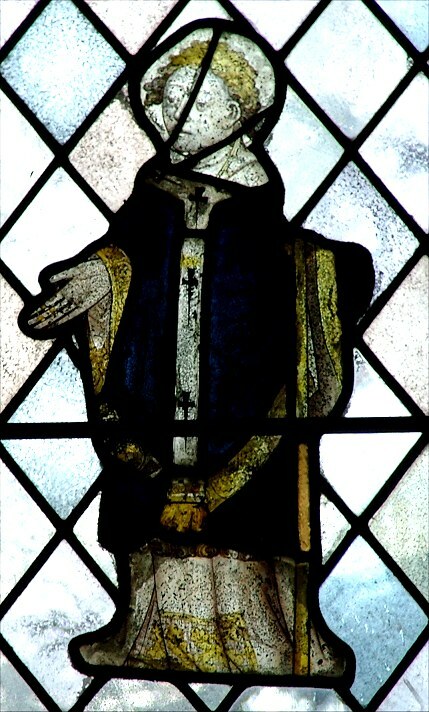 Sir William was one of those who sat in judgement on Charles I, and although he did not actually sign the death warrant, he was deprived of his inheritance, and for many years his name was under a cloud. The best of the memorials are below; hover to read the captions and click on them to enlarge them. St Peter is obviously worth the visit for the memorials alone, but there is rather more to it than that. 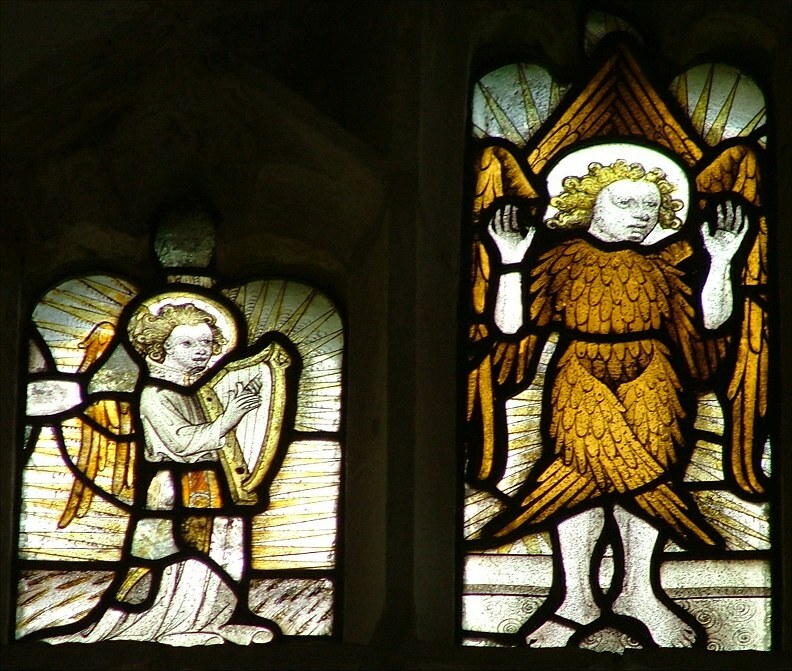 The church has one of the best collections of medieval and Flemish glass in central Norfolk. 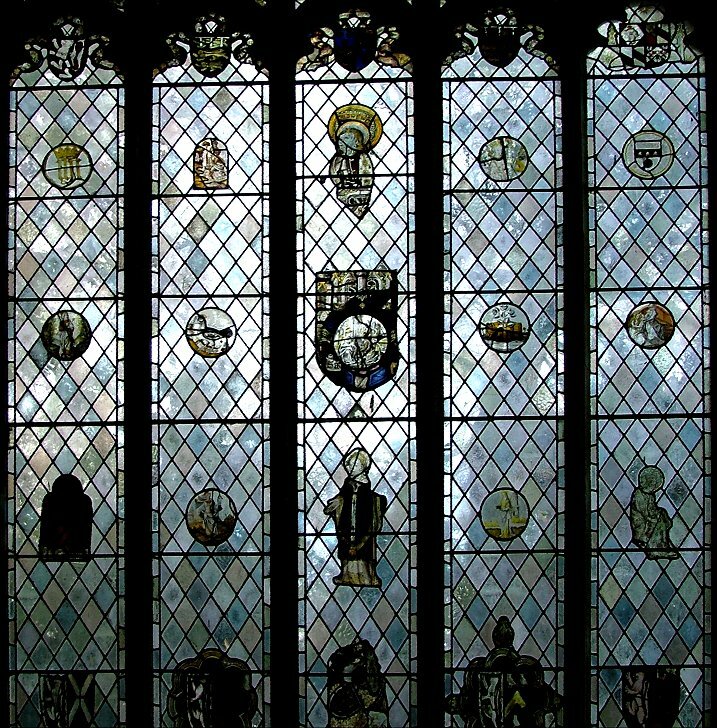 One of the most interesting aspects of the collection, given that the Hall was in the hands of four powerful families over the centuries, is that it includes a 15th century Grey arms, and so we may perhaps assume that the families that collected the later continental glass were adding it to English medieval glass that was already in situ. 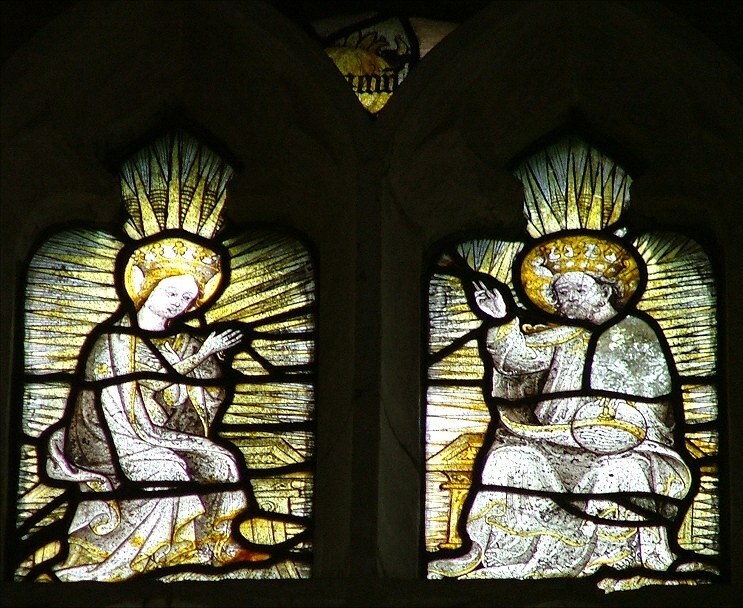 The most important glass is an English medieval Coronation of the Queen of Heaven, an extraordinarily rare pair of panels. 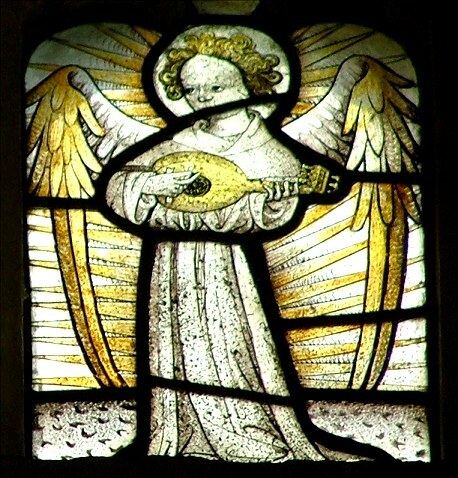 Also English are numerous angels, a Saint Cecilia playing her psaltery, and a Bishop. 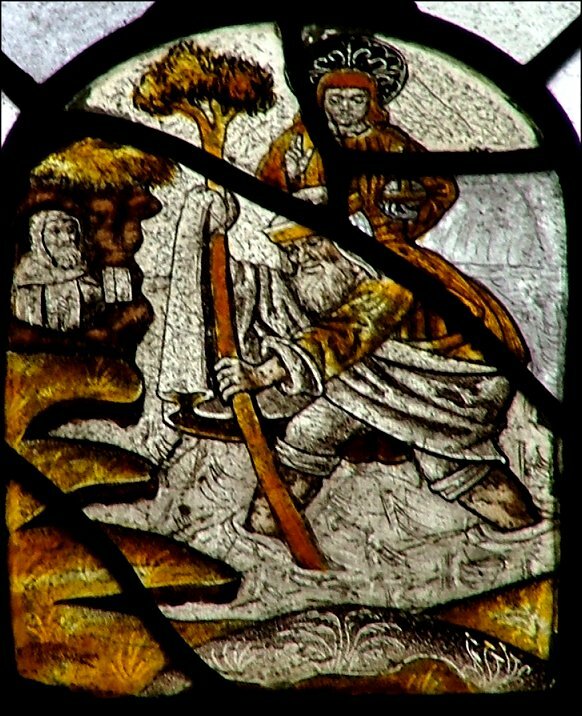 Continental roundels include St Barbara, and there is also a fascinating St Christopher with a hermit looking on, which I take to be 15th century continental. 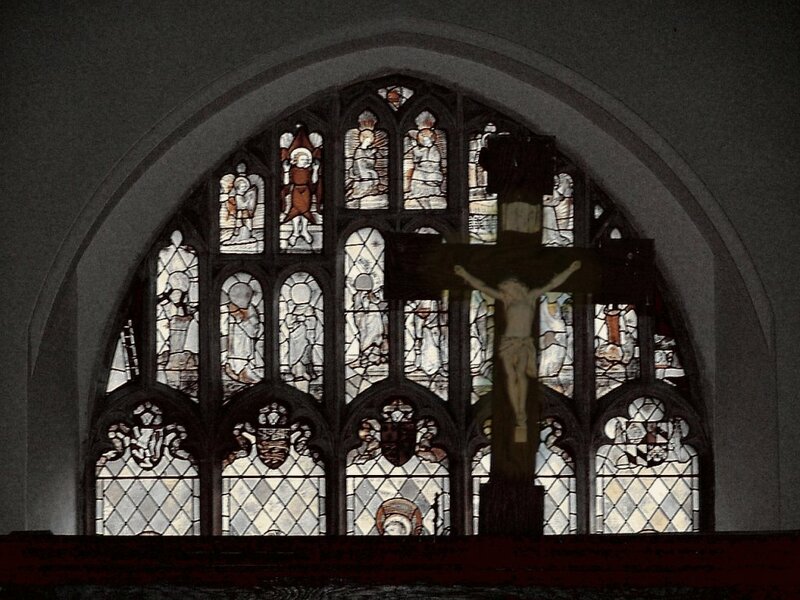 One of the striking things about the east window is that this is a collection set for display. I assume that this was the work of the late 18th century Atkyns family. 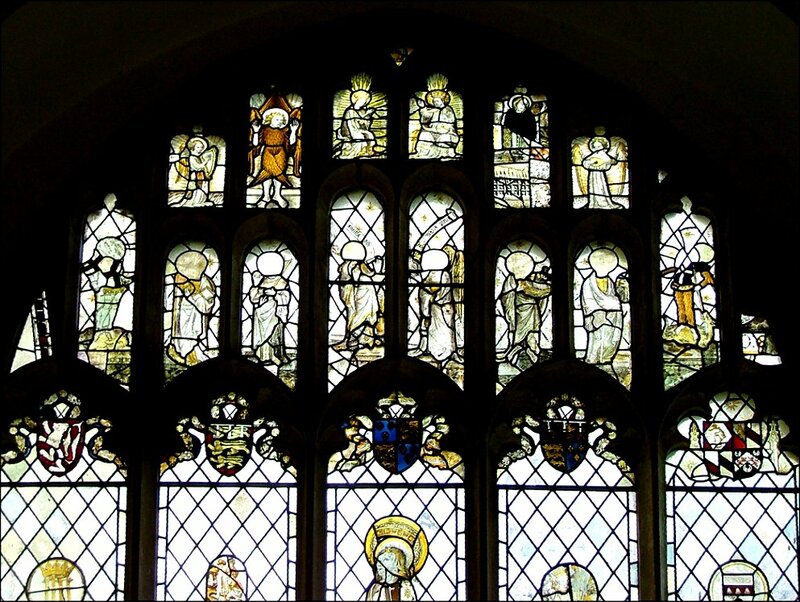 Mary Parker tells me that the entire window was reset in 1908 by the King workshop of Norwich, and that some of it is now in reverse order to that given in an account of 1851. Some of the panels are in poor condition, and I fear that this may be because they were originally set back-to-front, that is to say with the painting outside, exposed to the elements. The King restoration corrected this, but not before the damage had been done. Some of the highlights of the collection are featured here; click on them to enlarge them. 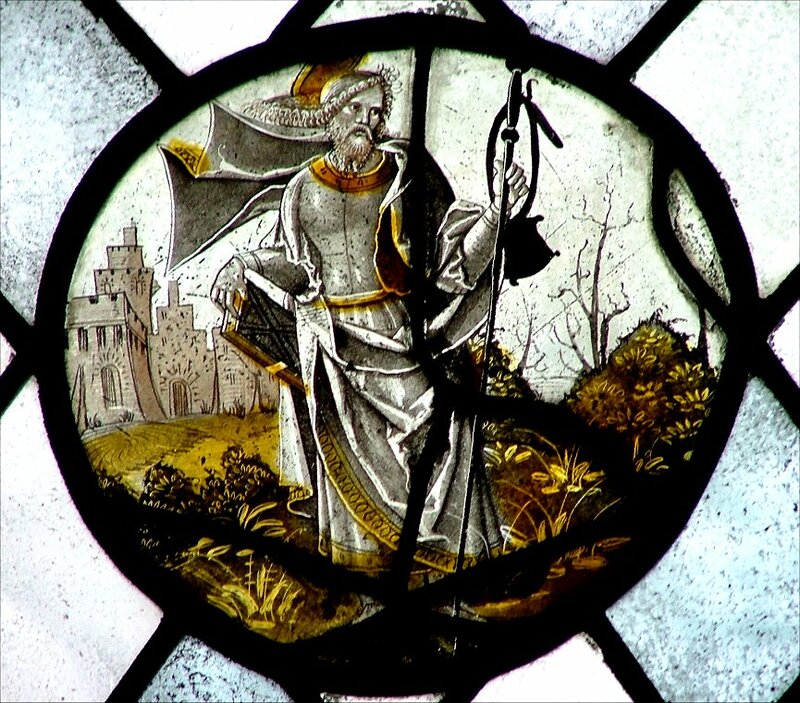 If St Peter had none of the glass, and none of the memorials either, there would still be much to recommend it. 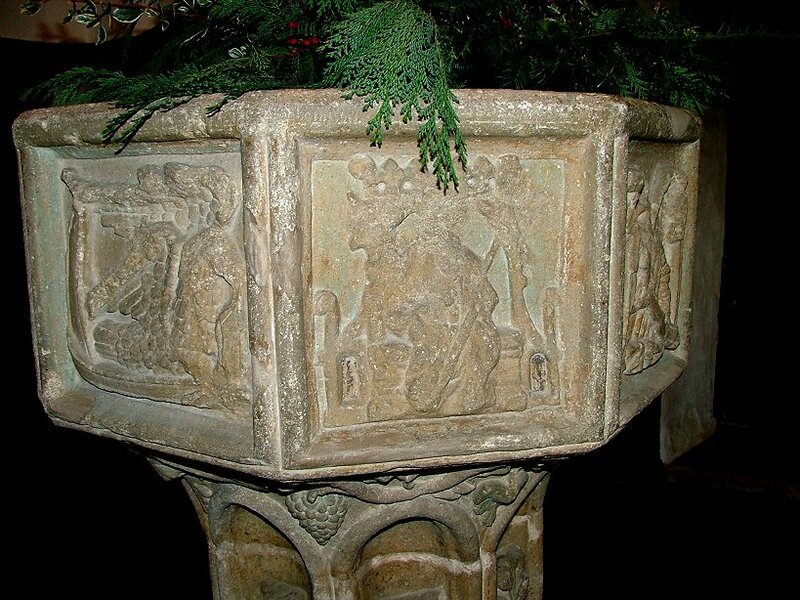 The font is fascinating; four of the panels feature evangelistic symbols, and two others flowers; but the final two panels are very unusual. 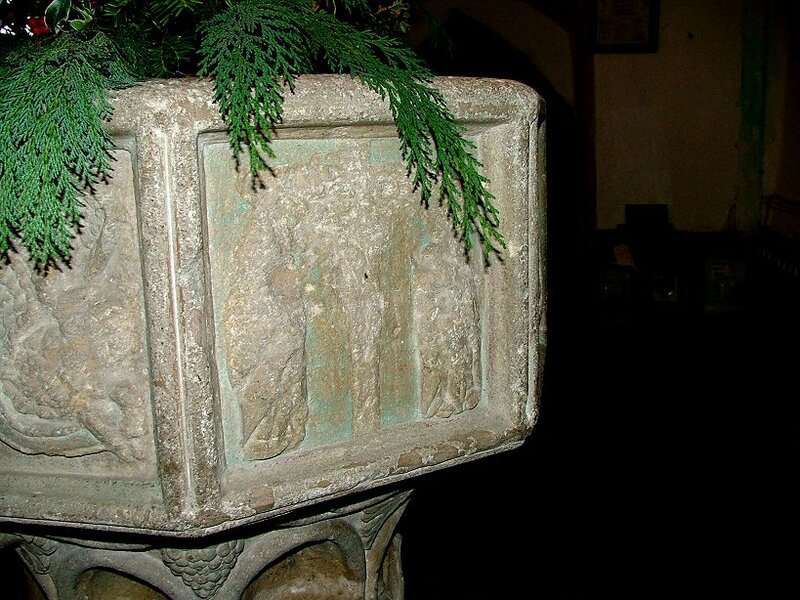 They are the only two that appear to have suffered iconoclasm; one is clearly a crucifixion scene, something like that which you find often on fonts in the seven sacraments series. The eighth panel is harder to decode. 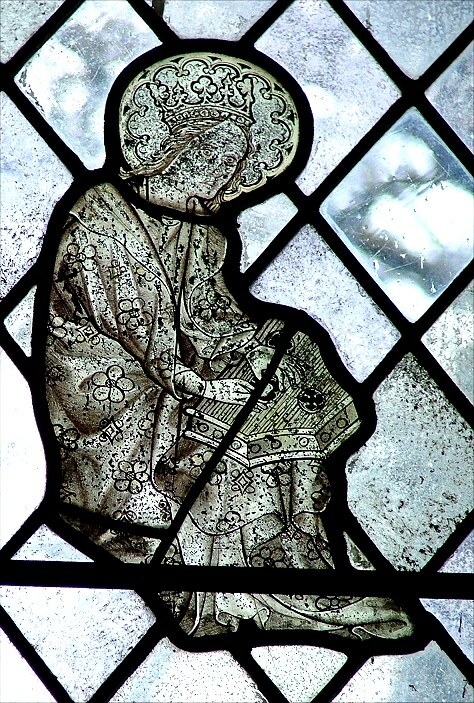 It shows a seated figure holding a staff - could it be Christ in judgement? Or the Mother of God enthroned? It is hard to say. 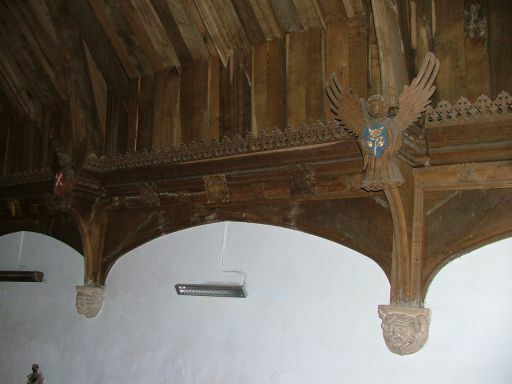 The renewed roof, with its restored angels, is set on outstanding corbels, and there is a good view of them from up in the gallery. 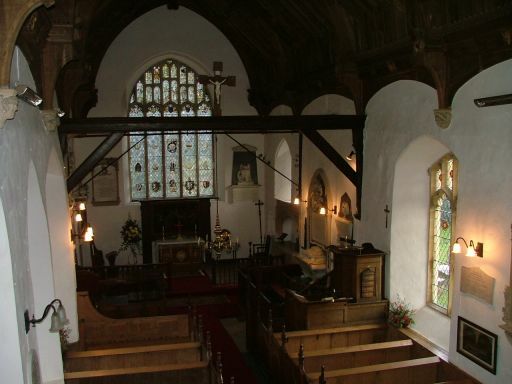 This is a small, narrow church, and the intimacy of the views from aloft is much to be recommended. In such a small building it even gives a good vantage point for photographing the east window if you have a decent zoom. Sir John Boileau built the gallery as a way of providing accomodation for the Sunday School, an interference that the Rector deeply resented. There was no way that Sir John's liberal paternalism and the Rector's fundamentalist intransigence were ever likely to accomodate each other. The firm security of tenure enjoyed by both, and the further sources of friction that arose between them, not least the interference of the Rector's wife, made the situation explosive. 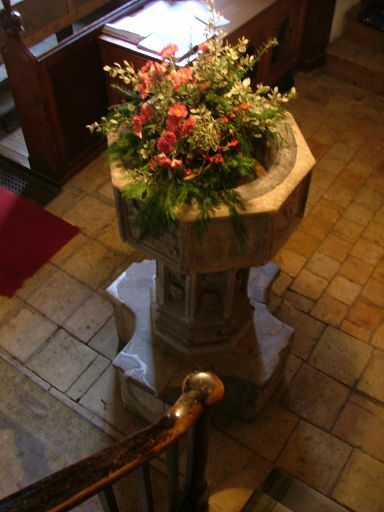 All around are hatchments of Atkyns and Boileaus. 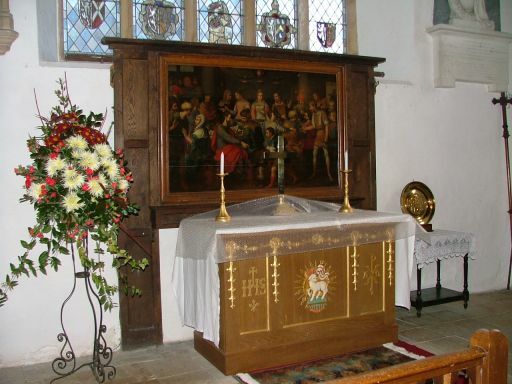 There is no doubt that they had their say, but strangely enough there is no sense of triumphalism; rather, they mark a church which is a real backwater, both geographically and in terms of English church furnishing and decoration. But if this was a backwater, it was a moneyed one; there is a real quality to the way everything was carried out here, and this remains today. 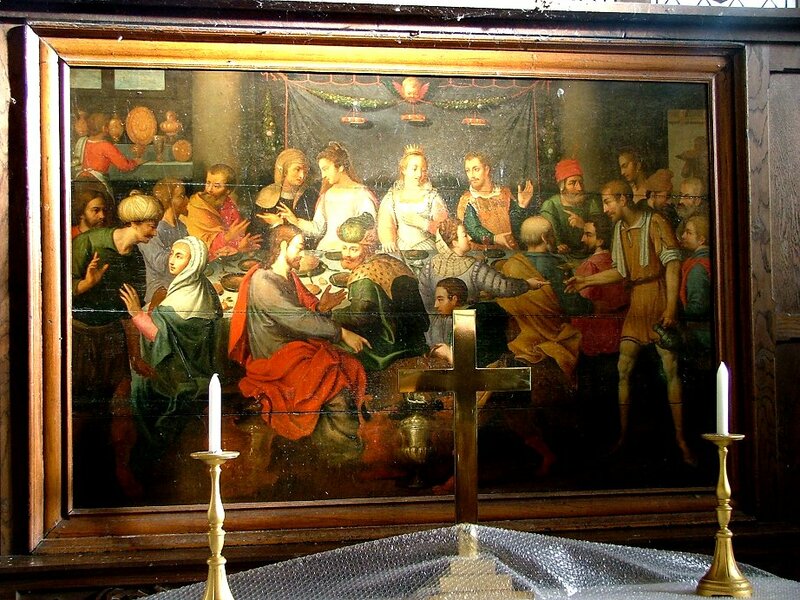 As a good example, take the late 16th century painting on boards of the Wedding at Canaa in use as a reredos. 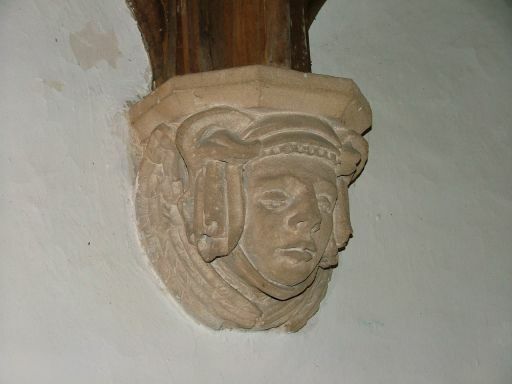 My goodness, what a thing to find in an English country church! At the time it was painted, we were all enthusiastic protestants, stripping our churches and our lives of things of beauty. But here it is, an extraordinary Flemish survival, probably collected in the early 19th century. As I said at the start, Norfolk is still full of surprises. This is not a church you find by accident, and so it fully repays the effort of getting here and getting in. 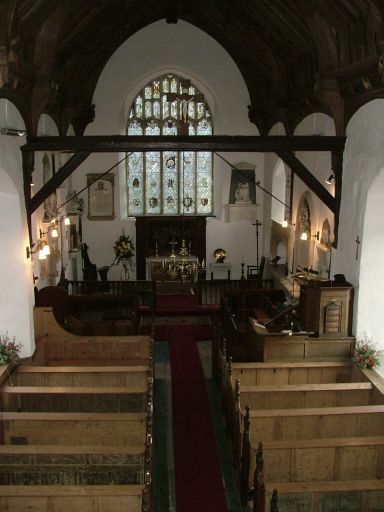 What must it have been like to attend divine service here in the 19th century? I assume that the entire parish, pretty much, worked for the Hall. Whose side were they on in the long-running despute between Squire and Rector? 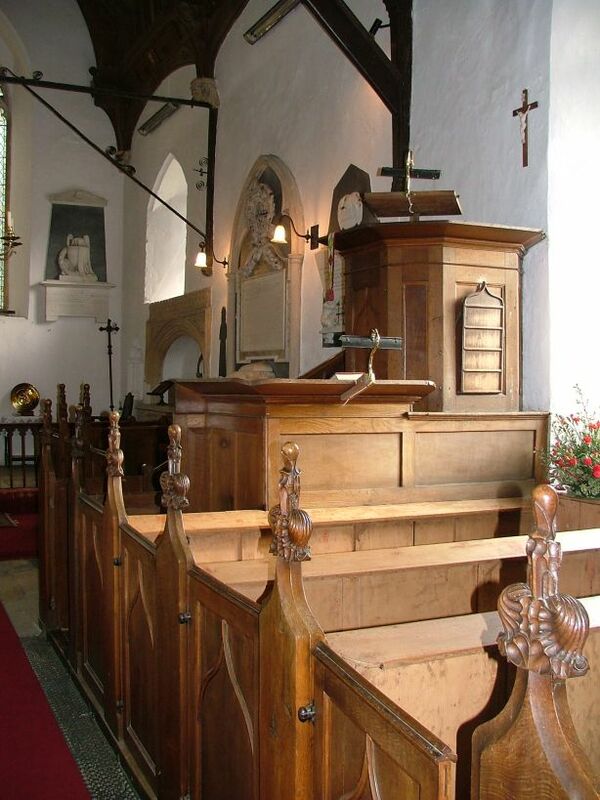 The Rector had the advantage of a three-decker pulpit. The reading light now faces north-west, but at one time he would have faced north-east, to address the Hall pew. This must have given him something of an advantage on a Sunday. 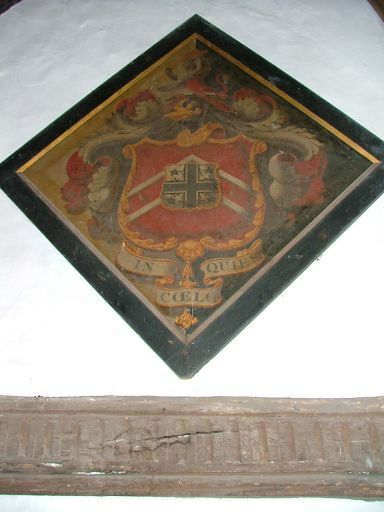 But today it is the Hall families we remember; the Grays, the Heveninghams, the Atkyns and especially the Boileaus. So, spare a glance and a thought before leaving for the cold stone memorial on the south nave wall for William Wayte Andrew, Rector through the middle years of the 19th century. In his evangelical Calvinist zeal he faced up to the Boileaus, but it must be with pursed lips that he is a silent witness to them now.